Form poems have been around as long as poetry, in fact poetry would have hardly been considered an art without adhering to strict rules and guidelines for meter and rhyme… as poems took on the structure of conversation, and each following generation pulled farther and farther from the preceding norm, forms became an identity a poem could showcase rather than a requirement. With that said, there are hundreds of variations of forms that you could try with your work. I will get into these more thoroughly as I revise sonnets and villanelles from my own collection. For now I will address the issue with all forms as they pertain to the editing process. Writing a form poem is easy: just follow the directions. Writing a good form poem is hard: make the directions more meaningful with your content. 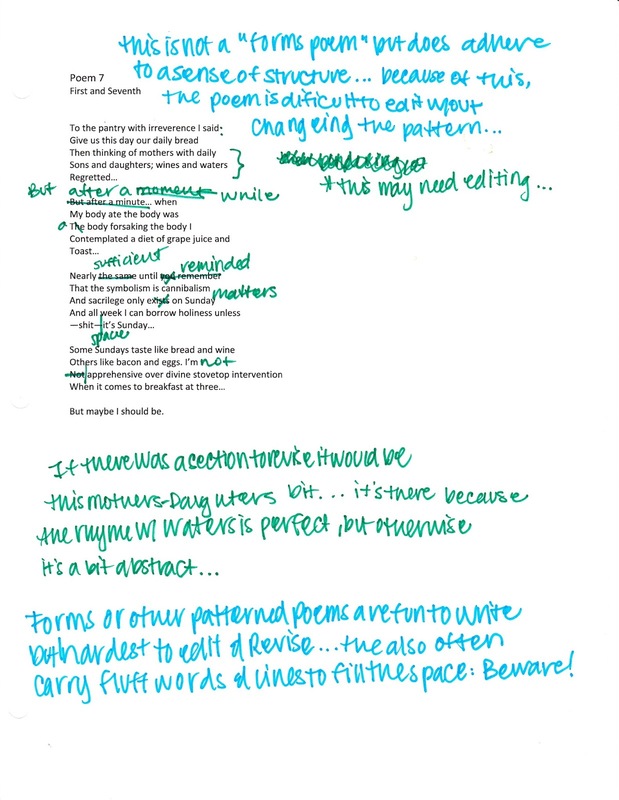 Editing a form poem is grueling: with the limitations of a form imposed on a poem, it can be hard to see where changes could occur and even more difficult to enact those changes without compromising the structure. 1. Do all of the words work? 2. What are you saying? Form poems can be tricky because the poem might end before the profound truth is revealed. Remember that poems are more than witty compilations of words, and that even in a poem with structure the message must bring something new to light… or else why are you writing? 3. Should this be a form poem? For this particular piece, which has seen its fair share of editing in poetry classes during my undergrad, question three is my main concern. I can spruce up the words, I can add more umph, but there are still some areas that need work. For example, the mother-daughter lines in the first stanza are a little bland… I wonder if they are just filling in the form or of there is something more there. Forms are a fun way to challenge your poetry and expand your ability to control language. They can also be a sore spot in your collection if you don’t give them proper editing. With the three steps I have for editing poems, and maybe some of your own, you will be able to successfully tackle your more structured work without turning a blind eye to the form’s shortcomings. Who knows that Keats or Shakespeare might have written had they been allowed to open their structure. Who’s to say what Whitman or Pound or H.D. might have penned had they been forced to work with structure instead of poetic philosophies. As a Millennial writer you have the best of both words, so write and edit to the peak of your abilities, knowing that there are no walls around your work but the ones you create for yourself.